Review: 2013-08-02, the fight between Javier Fortuna and Luis Franco was not so exciting: it gets two stars. The undefeated Javier Fortuna (22-0-0, 16 KOs) entered as the No.9 featherweight in the world while Luis Franco (11-1-0, 7 KOs) entered as the No.62. 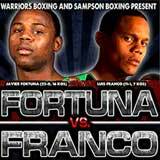 Fortuna vs Franco is the main event of the night. Watch the video!